At a talk at Harvard in 2011, Carolyn Porco, head of Cassini's imaging science team reported that “the mother lode of all discoveries was discovered at the South Pole” of Saturn's small, icy moon, Enceladus.aid Carolyn Porco in a talk in 2011 at Harvard University. She described Cassini’s findings of elevated temperatures in the moon’s polar region, as well as an enormous plume of icy particles shooting tens of thousands of kilometers into space. Analysis of the icy trail, which includes water vapor and trace amounts of organic materials such as methane, carbon dioxide, and propane, suggests it is fueled by geysers erupting from what later proved to be a global ocean buried beneath the moon's ice surface. More recently Edwin Kite, assistant professor of geophysical sciences at University of Chicago called Enceladus "an opportunity for the best astrobiology experiment in the solar system." 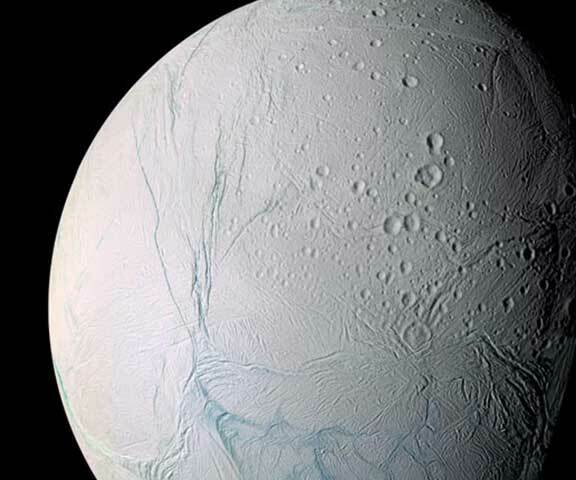 He added that Enceladus serves as a leading candidate for extraterrestrial life. Cassini data have strongly indicated that the cryovolcanic plumes of Enceladus probably originate in a biomolecule-friendly oceanic environment. The persistence of the massive, explosive fissures on the surface of Saturn's sixth-largest moon, despite the moon's astoundingly frigid surface — have remained a mystery for 11 years. This week, researchers from Princeton University and the University of Chicago showed, however, that the fissures could be kept active by the sloshing of water in the vast ocean that scientists suppose is beneath the moon's thick ice shell. 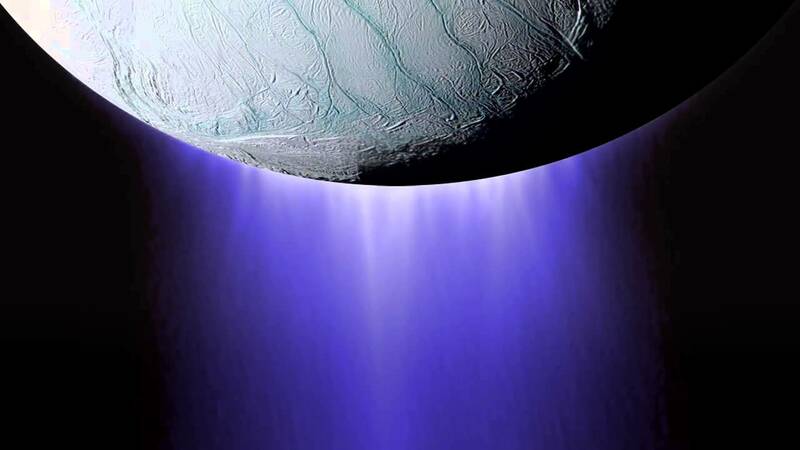 The findings could help provide a clear objective for future satellite missions to Enceladus, which the scientists suspect could host life. "On Earth, eruptions don't tend to continue for long," Kite said. "When you do see eruptions that continue for a long time, they'll be localized into a few pipe-like eruptions with wide spacing between them. It's a puzzle to explain why the fissure system doesn't clog up with its own frost," he said. "And it's a puzzle to explain why the energy removed from the water table by evaporative cooling doesn't just ice things over." The tiger stripes of Enceladus regularly emit towering plumes of vapor and frost particles, as seen above. NASA's unmanned Cassini spacecraft first observed the fissures in 2005 and its data strongly indicates that the plumes probably originate in a biomolecule-friendly oceanic environment. Since Cassini's initial observation, scientists have worked to explain their cause, size and regularity. The researchers suggest that the plumes originate from water in the fissures that alternately rises and falls as the slots are flexed by tidal stresses in Enceladus' icy shell. The heat this regular motion produces keeps the water from freezing. Carolyn Porco said that Kite and Rubin's work addresses a number of puzzling questions about the moon's fissures. The Geysers of Enceladus — Will Saturn's Moon Reveal a "Second Genesis"? Cassini Spacecraft Reveals Enormity of Saturn's Rings –"Gaps as Wide as Planet Mercury"